27-year old forward David Atkinson (203-F-91) put on an amazing game in the last round for league's best team Bima Perkasa and receives a Interperformances Player of the Week award for round 2. He had a double-double of 43 points and 15 rebounds, while his team outclassed Satya Wacana (#3, 1-2) with 35-point margin 97-62. It allowed Bima Perkasa to consolidate first place in the Indonesian league. But it's just the very beginning of the season and Bima Perkasa won both games without losing any. It's too early to say anything as the standings can be changed completely after next round. In the team's last game Atkinson had a remarkable six three-pointers out of 10 attempts. He turned to be Bima Perkasa's top player in his first season with the team. Salem International University graduate has very impressive stats this year. Atkinson is in league's top in points (2nd best: 30.5ppg), rebounds (5th best: 13.0rpg) and averages solid 42.1% from behind 3-point line. Second best performed player last round was Jarad Scott (203-F-95) of league's second-best Hang Tuah. 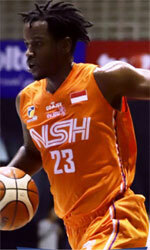 He is American forward in his first season at Hang Tuah. In the last game Scott recorded impressive double-double of 32 points and 15 rebounds. Of course Hang Tuah cruised to a 89-81 relatively comfortable win over NSH (2-1). The season is still at the very beginning and this victory may help a lot. Let's wait for the next round. Scott is a newcomer at Hang Tuah and quickly became one of team's most reliable players. He belongs to the best scorers in the league with 27.7ppg (#3). He also registered 14.0 boards per game. Former Union University, TN star Scott is a former Eurobasket Summer League player, which is considered top international summer league in the market. Third place about best performers goes to another Bima Perkasa's star - guard LeShaun Murphy (183-PG-90). Murphy showcased his all-around game by recording 28 points, thirteen rebounds (!!!) and five assists in the last round. He was another key player of Bima Perkasa, helping his team with a 97-62 easy win against #3 ranked Satya Wacana in a game of the week. Bima Perkasa has a very good start of the season. But there were just 2 games played, so it's too early to judge them at this stage. Murphy also has a very good start of the season with very strong stats. Murphy has a great season in Indonesia. After only 2 games, he made it on the list of the league's leaders in points with 22.0ppg (7th best), rebounds with 10.5rpg (7th best) and assists with 3.5apg (8th best).